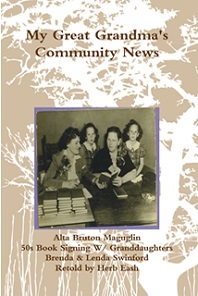 Alta Bruton Maguglin is the wife of Dee Maguglin, a farmer living in the Votaw community, Live Oak County, Texas. Several years ago Dr. A. Packchanian, of the University of Texas, in the course of research on chagos disease spent some time in the Votaw community, staying at the Maguglin home. The doctor has returned to the community on several occasions since. According to Mrs. Maguglin, the doctor asked her one day why she did not write. She, in turn, asked him what she should write about and what she should do with the manuscript after she had written it. He suggested that she write what she thought, and that she send it to her local newspaper. This she did, and the newspaper, known as the "Live Oak County Herald and McMullen County News" published her items and comments. After a time, "Our Community News," became one of the most popular columns in the paper, even among people who had never been to Votaw, who did not know anyone there, and who had never before even heard of the community. Comments of these people, such as the one below, impelled the editors to publish "Excerpts from Our Community News": in book form. Dallas Texas. You give us a good paper of which the county should be proud, very proud. Our Community News" is worth the price. One gets a good perspective of the social, economic, industrial and church life of the section where ever it is. The human touch, in a parlance, not uninteresting but unvarnished, is most refreshing. Never cut that correspondent off.